Enjoy a relaxing vacation in a popular resort area. Our home is only a 2 minute walk from miles of gorgeous beaches and a 10 minute walk from quaint but sophisticated seaside restaurants. The house, covered in palm thatch, lends itself to indoor/outdoor living with a large terrace, a thatched "kiosko" for garden dining and outdoor barbeque area with sink. The kitchen is fully equipped and large enough for two cooks to work. Stargazing and birdwatching in our palm studded yard is a real treat. It is possible to have privacy in our home even with a group of six. Housekeeping and gardening are provided once a week. We love our island experience and look forward to it every year. We are in our sixties and have been Real Estate Brokers for 30 years. We are slowing down our business and are looking forward to more time for travel, exploring great cities, enjoying classical music and museums. We also enjoy interesting cuisine, the countryside, small villages and old houses. 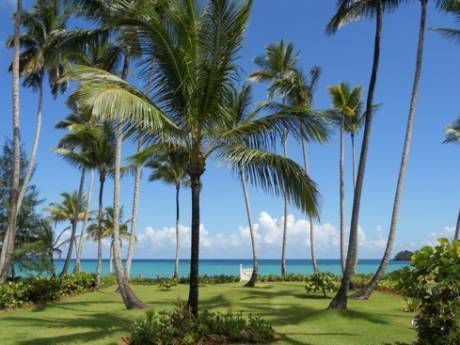 There are many French, Italian, German and Swiss expats and tourists in Las Terrenas who contribute to the cosmopolitan atmosphere of this Dominican town. There are great markets, bakeries and delicious food at many local restaurants. It is possible to buy dorado(mahi mahi) shrimp and lobster on the beach from local fishermen and to grill it in our thatch covered outdoor kitchen. Las Terrenas has 7 miles of incredibly beautiful beaches and is fast becoming an area where there are many water sport options, windsurfing, kitesailing, diving and snorkelling. Whale watching in Samana bay in season(40 minutes), a trip to the national park Los Haitises to explore caves and bird rookeries(30 minutes), horseback riding (5 minutes), quad safari expeditions and more are all easily arranged.